sings to the secret in all of us. speaks of the open beyond all of us. by worship or by knife blade. stays, silent speakers from somewhere. saving mass from chaos in life or poem. to spin us deep and inward. 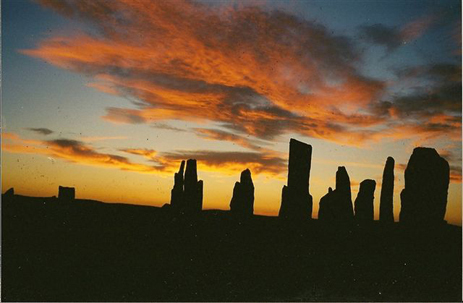 “They’re just a pile of rocks, big stones, boulders…” say friends who are not–as I am— hooked on stone circles. “Not Stonehenge, of course,” they usually add. Stonehenge gets attention: its sheer size, its appeal to tourists, druids, new agers, mystics, and a vast array of scientists who study angles, soil samples, astrological patterns. Stonehenge is magnificent, no doubt about it but I haven’t revisited it since the 1980s. It’s all the other little, not so little, obscure, not so obscure circles that entice me. And there are over 900 documented sites in the British Isles, over 300 in Ireland, and they abound in Malta, surface in Portugal…and the list goes on. The circles now tend to be in rural, remote sites (exceptions are many, of course); they are there because those areas have not needed to destroy them to construct modern structures. In pastures and alongside lakes, on hills, near cliffs, they have been ignored and have endured. In finding them, it is easy to feel closer to nature, to feel an intimacy with all that has gone before, to feel a certain optimism about what may lie before us. That which required vast communal effort for some overriding spiritual purpose has endured. There’s a lesson there. They have endured for thousands of years. Stonehenge is a baby in the field, dating only from 2500CBE. Most circles are incomplete now, stones having been carted off, buried, broken up for other uses, destroyed as heathen sites. Yet there they are, slanted, fallen, chipped, rubbed by cattle, pushed aside by oak trees, there they are. Endurance alone connects them and us to another time, pre-wheel, pre-written language, pre-“civilization” as we define it by cities, culture, and communication congestion. The circle itself is a universal symbol: unity, eternalness, no beginning as a straight line must have, no ending as a pyramid has. I look at the circles and see a different view of the world, the cosmos, these circles are connected to the earth and each other. Its an oversimplification to note that church spires and cathedrals soar toward the heavens, implying a world up there, higher, to be “aimed for” (“ah that our reach should exceed our grasp or what’s a heaven for,” said Browning); a world far away where all is exquisite, streets are gold, robes are white, where all the hard work and sordidness of this world have been left behind…this is a different outlook surely from the spiritual ethos that created the circles. They don’t soar, they circle; they enclose a sacred area in the same way a church and cathedral do, but they evoke the mystery of the earth, not the sky; they speak of humanity, not gods or goddesses beyond and detached. I get a feeling of sacredness here, not there.